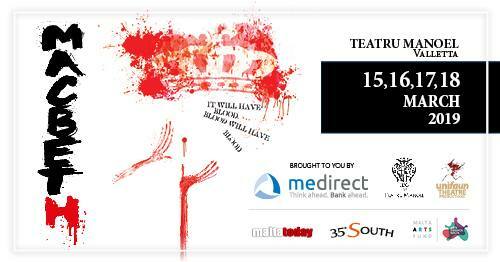 Teatru Manoel presents an exciting new production of one of Shakespeare's most famous tragedies. Shakespeare's masterpiece tragedy about ambition comes back to Malta in this wonderful production. Victorious from battle, heroic Macbeth allows three witches to feed his inner darkness and ambition so that he commits regicide and becomes king. Egged on by his wife, Macbeth commits this atrocious act while the king is resting inside his castle. To keep power, Macbeth becomes blood thirsty, leaving a trail of blood anywhere he goes. The opposition finally unites with the English forces and Macbeth is defeated.